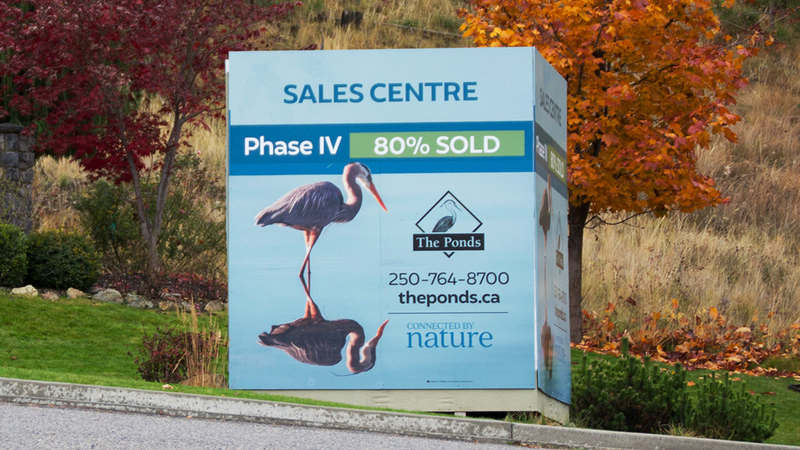 The Ponds is a 450 acre master-planned community in Kelowna’s Upper Mission neighbourhood. For their 4th phase, they wanted to update their signage and marketing materials with a new look. Phase 4 consists of only 38 hillside lots with panoramic lake and city views. We took the opportunity to replace the dated watercolour logo with a pen and ink version that better represented the higher end offering of their fourth phase. The one colour representation was more versatile across different applications, and complemented the custom photography used in the revamped the ad creative and other materials. With each phase of development, a refresh in the look is needed to keep it new and exciting. This is a long term community development that will last more than a decade. Having a fresh look for each phase is vital to renewing the interest in the properties available.